Our Pastor, Rev. Peter Jarrett-Schell was born and raised in San Francisco, California, to the Rev. Donald Schell, an Episcopal Priest, and Dr. Ellen Schell, a nurse. He is the third of four children. After attending college on the east coast, he moved to El Salvador, where he served as a lay minister for the Episcopal Diocese of El Salvador. Upon his return, he began his studies in Seminary, where he met his wife, the Rev. Rondesia Jarrett-Schell. After their graduation, they were married, and moved to the Tidewater area of Virginia where Peter worked for a year as a pipe-fitter in the Newport News Shipyard, while his wife worked in adoptions assistance for Lutheran Family Services. 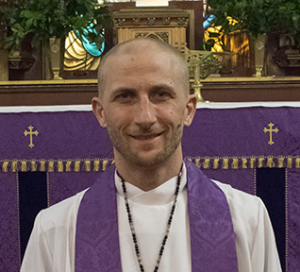 Peter was ordained to the Priesthood in 2006 and accepted his first call at the Episcopal Church of Our Saviour, Silver Spring. While there, he developed and grew the congregations Latino and youth ministry. Working with the Industrial Areas Foundation, he lobbied the Maryland Legislature to pass that state’s own version of the Dream Act. In 2012 he accepted a call to serve as Calvary’s fifth rector. One year later his first son, Joshua Ibrahim was born. Apart from parenting and marriage, his ministry at Calvary has been the greatest challenge and blessing of his life thus far. The Rev. 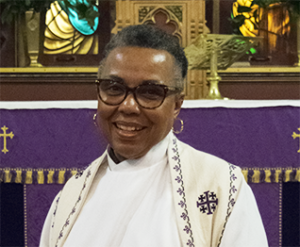 Dr. Gayle Fisher-Stewart came from Our Savior, Brookland, to Calvary Episcopal Church in May 2014. Gayle is a native Washingtonian. She grew up in northeast DC and attended St. Luke’s-DC. As with a lot of young people, when she got to the age where her parents didn’t make her go to church, she chose to stray; however, God is ever-working. The draw to the church and God’s word was strong and after running for a long time, she stopped and accepted the call to ordained ministry in 2013 and was ordained to the priesthood in November 2015. Gayle retired from the Metropolitan Police Department in 1992. She has taught at the University of Maryland, the University of the District of Columbia, the University of Maryland University College, and the Johns Hopkins University. An ardent reader and a life-long learner, she holds a bachelor’s degree from the University of Maryland University College and master’s degrees from the American University, the University of the District of Columbia, the University of Maryland, and Wesley Theological Seminary. Her doctorate is in political science also from the University of Maryland. The Wardens and Vestry are lay members of the congregation elected to oversee and administer the business of the Church. They are charged with ensuring that the many resources of our congregation are effectively and appropriately used for Calvary’s mission of spreading the Good News of Jesus Christ.